Exactly one year ago tomorrow, I had a massive breakdown. Sobbing, I proclaimed that I wanted out of this life. I didn’t want to fight anymore; I didn’t want to live with chronic migraine any longer. I even wished for cancer so that I could choose to not treat it, thus dying without technically committing suicide. Today, my head pain is at a level 4, which is the highest the pain has gotten in a week. In the past four months, the pain usually topped out at a 5, occasionally a 6. Still far from comfortable, that’s way better than daily pain that hits a level 7 or 8, where I was last January. I don’t know how these pain ratings appear to anyone outside my body, but to me, pain reduction of even a single number is cause for celebration. In the 11 years that chronic migraine has been the focus of my life, last year was the first in which I made significant progress in reducing the severity of attacks. I tried more than three dozen medications in that time and countless other Western and alternative treatments and diets, none of which had any effect. To see any progress is amazing to me; to now be at a place where I expect even more improvement than I currently have experienced is astonishing. Magnesium: Although I had been on magnesium before with no success, I noticed an improvement increasing the dose to 700 mg. After trying IV infusions to see if they would be more effective (they weren’t), I ultimately pushed my daily oral dose to 1,000 mg.
Cyproheptadine: The starting dose of 4 mg was enough for me to feel a bit better. Each 4 mg increase brought additional relief until I hit 16 mg, which didn’t seem to be any better than 12 mg. I’m back at 12 mg, though will probably try increasing it again, to be sure that I wasn’t just having a bad week the first time I tried 16 mg. Diet: It has been a year since I started an extreme version of a traditional migraine elimination diet. Until a month ago, the diet was horribly frustrating. It seemed like both nothing and everything I ate were triggers. I wondered if there were other aspects of foods that I was unaware of that could be triggers. Then a reader mentioned that she feels better when she avoids foods with histamine. This started major research and an even more drastic diet to cut out amines and salicylate. The initial improvement started to look like a fluke as the migraine attack severity returned to previous levels. A week ago, I switched from ground dark turkey meat to skinless chicken breast as my main protein source and the migraine severity dropped to a level 4. I’m still tweaking the diet and waiting to see a nutritionist. It will be a long process as I test out foods I’ve been avoiding, but I really think histamine and salicylate content in foods and body/beauty products is a major component of my debilitating migraine attacks. I have so much more to tell you! There’s a detailed post about the diet coming later this week. First I needed to write this overview to remind myself of the massive improvements that 2012 brought. Sure, I still feel worn out and discouraged at times, but every little bit of progress shows me that chronic migraine is necessarily not a life sentence. A year ago, I was convinced I’d never escape that prison. I was basically the prototype of chronic intractable migraine. (In a bizarre sort of way, that sounds like bragging.) Ten years with no improvement. Countless doctors, naturopaths and all manner of traditional and alternative health care providers have given up on me. I had given up on me. If I can see improvement, so can you. The struggle may be long and arduous, but there is always, always hope. Hang in there. Some days hearing a gaggle of children screaming is all it takes to cheer me up. About once a week, teachers at the local elementary school round up all their students for a trip to the park. As they walk past our house, they are always chattering happily. Never are they annoying, just endearing. Although it rains a lot in Seattle, usually it’s barely a drizzle that never lasts long enough to get you wet. But there’s always an exception. During today’s walk, it began to pour. 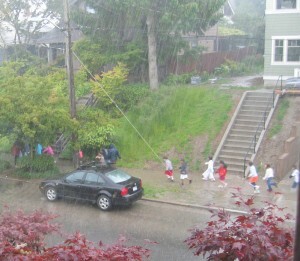 Fifty kids yelled in shock and delight as they huddled under the trees to wait out the deluge. They waited and waited. Drenched, they turned back after about five minutes. And then they ran, talking loudly and laughing all the way. I captured the tail end of the crew in this photo. (You can see the water pooling in the neighbor’s side yard — literally five minutes had passed since it started raining. Less than an hour later we’re enjoying blue skies and a gentle breeze.) These joyful children are definitely a visual (and auditory) representation of hope for me.